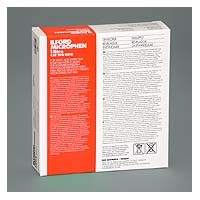 1 liter size packet of Ilford Microphen film developer. Ilford Microphen is a fine grain B&W film developer which provides an effective increase in film speed while retaining much of the grain charactersistics associated with fine grain developers. Microphen is particularly useful when processing with exended development times to "push process" fast films such as HP5 Plus, Delta 400 Professional, and SFX200. The two powder components are mixed with water to create a stock solution, which may be further diluted 1:1 or 1:3 for one-shot processing. For detailed information on using Ilford Microphen and other Ilford powder film developers, please refer to the Technical Information PDF. - for a Safety Data sheet for the stock solution click here.